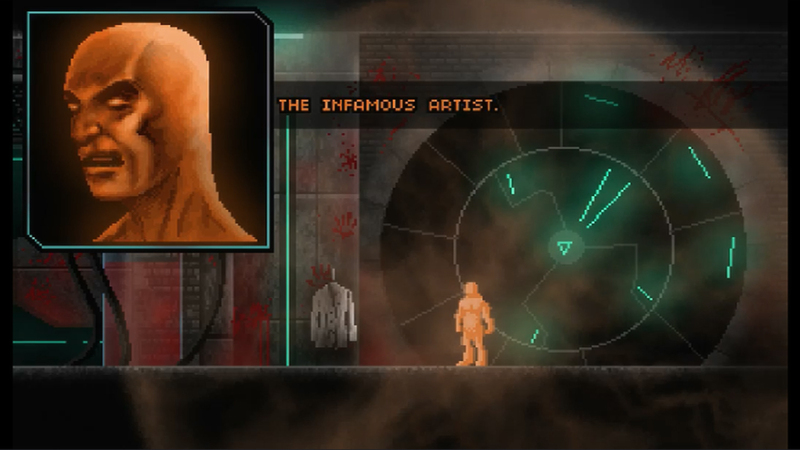 Dystopian cyberpunk futures are quite common in games these days, and the latest indie game to follow this trend is Wormwood Studios’ Until I Have You, developed by a team of two people. It follows the story of the protagonist, named in-game as the ARTIST, going on an adventure to rescue his partner Emily from his former employer NEO-FAITH. Their former employer kidnapped her after ARTIST decided to leave his job on the request of his partner. He is helped by the usage of an exoskeleton suit which gives him special powers, though it comes at a cost. Overall, it’s a semi-original idea for this genre of game. Firstly – let’s talk about the gameplay itself. The game is a 2D platformer comprising of 12 chapters with 4 levels and a boss each, taking place within a different setting. The goal for each stage is to get to the end of the stage without falling, getting killed or depleting your Hysteria gauge (more on this in a second). 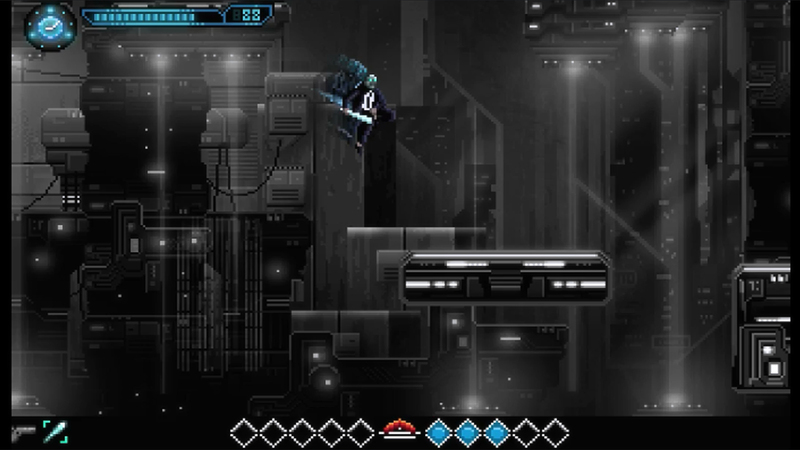 You are given various weapons as you progress through the game that you can use to defeat the enemies in the game. 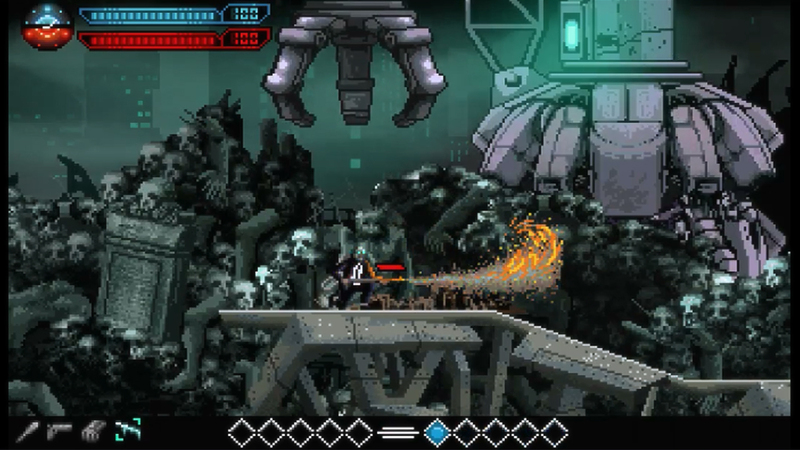 At first, you only have a bat and a gun, but as you progress further through the game a laser gun and a flamethrower become available for your use. These new weapons are used in the gameplay well, where some NPCs can only be defeated using a certain weapon. At the end of each stage, you are scored on various requirements and given a percentage raring out of 100 – things you get judged on included on method of death (if at all), whether you kill any of the enemies, and if you so what you killed them with. The platforming itself works fine, there are no issues with the physics and once you get used to them the player can handle the challenges put forward to them. This title doesn’t require high-end PCs to run and the game generally has little problems and in my case it only crashed a couple of times (and one of these was patched by the developer). Speedrunning is essential in this game, and you’ll need it later on when you can’t run n’ gun every enemy in sight. One of the unique features of this title is the Hysteria gauge. In the first few worlds this serves as a time slowdown mechanic where you are able to use it to identify demon enemies and hit them. However, following a plot event, the mechanic is enhanced so that if the player takes damage their Hysteria gouge decreases – when this reaches zero, you fail the stage and have to start again from the last checkpoint. So this changes how you approach the game. If you were strategically killing every enemy up till this point, you are no longer able to do this as you will run out of Hysteria. It’s a really nice touch and adds to the challenge of this platformer. If not, the formula risked running stale as the game would have become too easy as it adds an extra element of strategy. Do I kill this enemy and lose more Hysteria, or do I run past them and risk being shot or killed in some way? Now onto the visuals. The sprite drawings are detailed and are very well done, even though the style lacks impact due to many other sprite based platformers also being available on Steam, so based on visuals alone it could get lost in the crowd. The event scene CGs that occurred at the start and end of each chapter were also well designed, and it allows the player to get a peek into the world in which Until I Have You takes place. The images include violence and blood so I can imagine they weren’t the easiest things to sprite, however the sprite artist should be commended for the detail found within these CGs. Likewise, the music is well made, and the dark chiptune melodies fit the atmosphere rather well. Chapter Seven’s level music is among my favourites. The developer uploaded some sample OSTs to YouTube but I would personally pay for a digital OST release via Steam. The voiceovers for the characters are also well done to the point where I consider them better than most dubs in localised Japanese titles and it is also clear that there was effort put into them to match the atmosphere of the game, despite the ARTIST’s voice feeling a little cliché for its role. The plot perhaps is one of Until I Have You’s biggest strengths. I won’t spoil the plot aside than it gets quite dark at times and the direction the story takes allows the variety in the game’s settings and level design to be expanded even more than had they not taken this direction. You will understand more when you play the game, however it prevents the game from getting stale due to the dissimilar environments. However with the changes in these environments also comes a fluctuation in difficulty – the difficulty curve is more like a difficulty squiggle. While the first few worlds and last two worlds have difficulty that is appropriate, some worlds in the midgame are harder than others, with chapters 7 and 8 being much harder than chapters 9 and 10. While I personally didn’t find the difficulty spike too much of a trouble aside from said worlds mentioned, the inclusion of checkpoints (which the developer added when I was near the end of the game) greatly helped speed up my playtime of 12 hours in the last couple of the worlds. The checkpoints greatly help make this game more accessible to more inexperienced players and allow more casual players to get through the stages without having to constantly restart the stages. However the controls also work pretty well (apart from the hoverboard controls being a little fiddly to use) as these can be remapped to the player’s liking in the Options menu, also helping with accessibility. This world is one such example of outlining the strengths and weaknesses of this game. It’s midgame and harder than easier later worlds with some ideas that appear not expanded on fully, like this crane. They only appear twice in one level in the entire game. However, the biggest issue I find with Until I Have You is that sometimes it feels like there are many ideas the developer is trying to offer up to the players but they aren’t expanded upon enough. Personally I would have preferred one less idea each world and focused on fleshing out the gimmicks and mechanics that were already introduced in the first three levels of each world. It reminds me a little of Nintendo’s Super Mario Galaxy 2 – too many ideas not expanded on, though I feel that unlike Galaxy, this is to the game’s detriment as it left me wanting more. However, this isn’t entirely true – in Chapter Six three of the five levels involve chasing the boss NPC for the world, which didn’t outstay it’s welcome and is an exception to the above point. It should also be noted that the gimmicks and mechanics themselves are explained very well without any text (with a few exceptions). This is good game design and along with the player making their own mistakes can also teach the player what not to do so they can try again. However as already stated a lot of time and error is also required for these stages at times, which can be frustrating for those that lack persistence. The levels themselves are in short bursts which allows for short bursts of play, which may be beneficial for those players whom lack the time for long play sessions, however to compensate for the short length it’s not an easy platformer like Kirby, it requires some grit to progress through. It’s more akin to Sonic the Hedgehog titles. This is also true of the bosses. The bosses are the main targets of this game that the protagonist goes out and kills, and there are twelve of them, one for each chapter. The bosses themselves have distinctive personalities and attack patterns but many of these were pattern based and once you worked them out it was easy as you only needed to know what to avoid and when, such as Chapter 3’s boss following a specific pattern of running, using your time travel mechanic and then attacking it from behind until it is defeated. This is a direct contrast to the difficult stages, which while on the one hand it is a nice relief from the difficult stages, it also shows off the weaknesses of Until I Have You the most. It does let the side down, and is a big blemish on an otherwise well designed game. The final boss is also a bit disappointing as it follows a pattern based formula, it would have been nice if there was a second phase at least that was more difficult. The penultimate boss. One of my favourites, and the perfect example of rounding off the gimmicks introduced in the levels preceding it as well as the game at large. Furthermore, once you finish the game, that’s that. There isn’t really much replay value once you’ve beaten the game however if you get 100% on the stages you’ll be able to get a Steam Achievement for it, thus giving some replay value. The other handful of Achievements also help with this, but this game won’t last you too long. The price tag of £10.59 (or $13.99) is quite modest and while I personally consider it an appropriate price point for the casual observer, those expecting substantial replay value may be quite disappointed. If you’re on the fence about this title, I would say get it in a sale particularly if you like replay value and challenging boss battles, however for those that like the setting and ideas behind the game, this wouldn’t be a bad choice to satisfy your cyberpunk craving.